Craig Denton is back at Worksop Town — as first-team manager. Denton, 32, will bring his own backroom staff to the Northern Counties East League Premier Division club. Shannon Brooks has been retained as club physio. Last season Denton enjoyed a successful first season in management after guiding Rainworth Miners’ Welfare to a 10th place finish in the NCEL Premier Division, 17 points above Worksop. Rainworth have now stepped down from the league. Denton added: “This is the culmination of hard work from myself, my backroom staff and the players I recruited during my time at Rainworth. “Worksop’s a huge club with an amazing fan base and after meeting with the club and hearing their views on where they want to be, it’s something I really wanted to be a part of. Worksop spokesman Jake Brown said: Craig beat off some real competition to land the role. Denton replaces Duncan Milligan, who parted company with the Tigers by mutual consent at the end of the season. 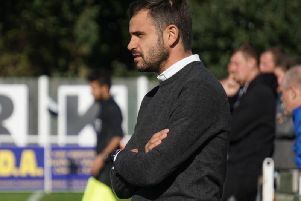 Milligan had taken over from Ryan Hindley, who resigned in January after a change of ownership at Sandy Lane, but gained just three wins from 17 matches.